Titanium Gr.2 hexagon nuts M12, acc. to DIN 934/ ISO 4032. The DIN/ ISO titanium hexagon head bolts and screws are generally used with its mating hexagon nuts manufactured in accordance with DIN 934 or ISO 4032. 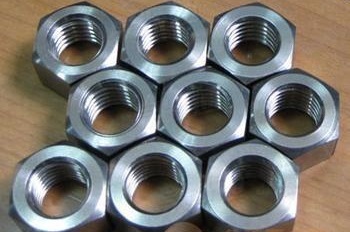 The nut material can be either titanium Gr.1, Gr.2, Gr,3, Gr.5, Gr.7, Gr.12, etc. There are two product grades available: product Grade A for threads d ≤ M16, and product Grade B for threads d > M16. 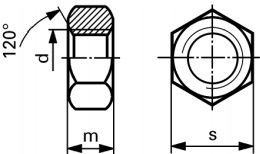 The technical drawing of DIN 934/ ISO 4032 titanium hexagon nuts. *The P refers to the pitch of the thread; the nominal s is the same as its maximum limit. *Only preferred threads are listed; dimensions for non-preferred threads are available upon request. *The thread shall be tapped in accordance with ISO 724, ISO 965-1 or DIN 13 Part 12 and 15.